Beach lovers will feel like they’re right at home on the tropical island of Sri Lanka, thanks to its extensive coastline and gorgeous beaches. Even the hotels and resorts, including the breathtaking Sri Lanka Jungle Beach luxury resort, know that their beaches are their greatest assets. Because there are so many amazing beaches to choose from throughout this island paradise, it may be difficult to figure out where you should go if you want to take in everything that this unique destination has to offer. To make the vacation planning process easier on yourself, continue reading for a short guide to Sri Lanka for beach lovers who are in search of paradise’s best. At Mirissa, which is a favorite of many tourists from around the world, you can lie down in a hammock, sip some coconut water, and feel the breeze against your face as you relax all of your cares away. This is one of the larger Sri Lankan beaches that you can visit and explore, but it’s the ideal spot for simply slowing down and not focusing on doing very much at all. Of course, if you want a little more action, you can go swimming or snorkeling in the water to see all of the marine life that surrounds the island. Plus, if you’re planning on visiting anytime between November and March, you can book a whale watching tour to try to catch a glimpse of dolphins and whales in their natural habitat. Yet another hugely popular beach, and quite possibly the most popular of all of the beaches in Sri Lanka, is Unawatuna. This beach is protected by a breathtaking coral reef, and there are hardly any waves, so it’s perfect for not only sunbathing on the pristine sand, but also swimming and snorkeling to explore the underwater world. Families with children will be able to play in the water and relax in the sun, and you can even take a glass-bottomed boat tour to see the reef’s beauty. Also, if you need some refreshments or food, there are beachside restaurants and cafes that you can enjoy as well. Bentota is a great place to book your stay in Sri Lanka because there’s a string of resorts and boutique hotels that line the golden sand. There are also fewer tourists there, even though it’s quickly becoming one of the more desirable beaches to pamper yourself and unwind for a while. Swimming, however, is limited if you’re going to be visiting during the monsoon season, but there’s a lagoon in the area as well. There, you can enjoy a variety of fun water activities, such as jet skiing and canoeing, as well as water skiing, so you definitely won’t get bored. And you can visit the Turtle Hatchery on the beach so you can learn about the sea turtles and help in the release of babies out to sea. Arugam Bay is the best beach if you’re hoping to go surfing in Sri Lanka. 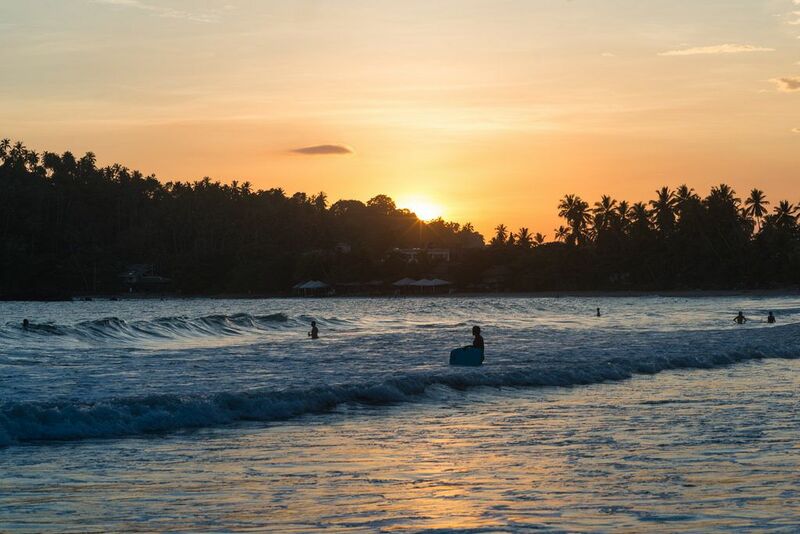 But even if you don’t surf, you can enjoy other attractions throughout this area, including national parks and mangrove swamps, where a wide variety of wildlife, from elephants to crocodiles, make their home. But, as with all other Sri Lankan beaches, if you don’t feel like exerting yourself, you can always lounge on the sand and enjoy the warm sun. Hikkaduwa is an area that has beaches that are wide with golden sand, as well as the amenities that you’d expect from a leisure vacation destination. The beach itself is quite popular because of the abundant amount of marine life that call the area home, so you definitely should make it a point to spend time swimming, snorkeling, and scuba diving while you’re there, as you can see gorgeous coral, sea turtles, and a variety of fish beneath the waves. In other words, if you’re hoping to connect with wildlife, this is the spot to be. With so many fabulous beaches to explore and enjoy throughout Sri Lanka, it’s no wonder that this island really is the ideal place to go on vacation if you are the type of person who absolutely loves spending time on the sand and in warm tropical waters. Between the beauty that surrounds you, the delicious cuisine and friendly locals, and the natural world that is yours to explore, this is a destination that you will never forget.